Melvin R Blumberg was born in Iowa and lived in Clinton most of his life. In 1931 when he was about 11 or 12, his mother commissioned a local artist to paint a portrait of him. A year earlier Grant Wood gained national notoriety when The Art Institute of Chicago awarded him a prize of $300 for American Gothic. Most mothers at the time would have insisted that their children dress up in their best outfits for a formal portrait. Mel however, was allowed to wear his favorite clothing, a red and tan argyle sweater and padded football pants. By 1955 Mel and Carole were married and had three children. They admired Wright's work and had ample opportunity to visit many existing Wright buildings in Iowa. The Stockman House (1908), Park Inn Hotel and City National Bank Buillding (1909), Delbert Meier House (1917), Walter House - Cedar Rock (1945), Douglas Grant House (1946), Alvin Miller House (1946), Carroll Alsop Residence (1948), and the Jack Lamberson House (1948). 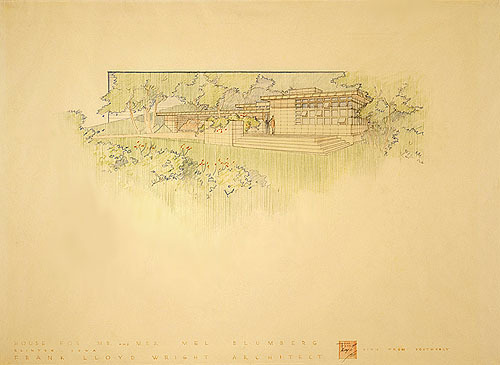 This admiration of Wright's work lead them to contacted him about designing a home for them in Clinton, Iowa. 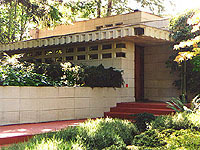 Wright agreed to design a home for them. But after not hearing back from Wright, Mel contacted him, wondering if he was to busy to design a home for them. On May 2nd, Wright dictated a response to Eugene Masselink. Dear Mr. Blumberg: You are right (although the word "overtaxed" has a more than normally unpleasant ring) we are en route (to) Wisconsin and Mr. Wright will be there after May 15th. You are welcome to come to see him if a mutually convenient time can be arranged. You could telephone us there at Spring Green 9248. Sincerely, Eugene Masselink, Secretary to Frank Lloyd Wright. May 2nd, 1955. 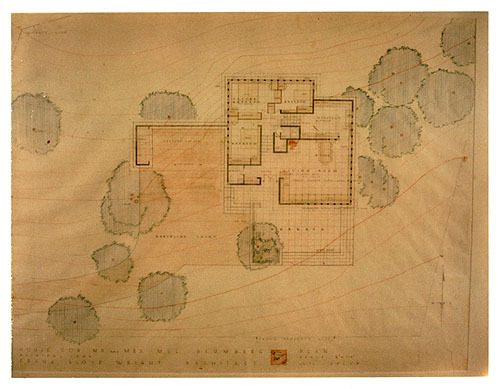 They did not take Wright up on the visit, but Wright did have the opportunity to design the home and send the plans. The Blumbergs were very pleased and planned a trip to visit Wright in Wisconsin. On September 20th, Wright dictated a response to Eugene Masselink. 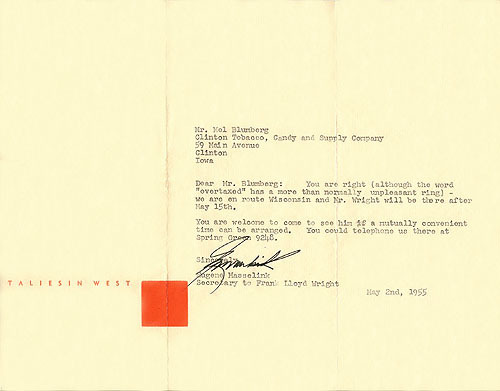 Dear Mr. Blumberg: We were happy to hear your enthusiastic reaction to your sketches - yours and Mrs. Blumberg�s. We shall expect to see you here on the afternoon of October 1st - unless anything unforeseen arises in which case I shall contact you at once. Sincerely, Eugene Masselink, Secretary to Frank Lloyd Wright. September 20th, 1955. Mel and Carole made plans for their trip to Spring Green and decided to take their son Dan with them. "After we arrived, we toured Taliesin and lunched with Wright's students", recalled Carole. "After lunch we met Wright in his office. A fire was burning in the fireplace, it felt very comfortable, and Wright was very gracious." Although initially impressed with the overall design, and gaining more insight into the details, they realized "the cost was more than we could afford and it was probably not the house to raise three children in" Carole said. "Wright was very understanding, very nice, and we genuinely enjoyed our time with him." Three days later Wright Wrote Mel a letter. Dear Mr. Blumberg: I guess I am to blame. I remember telling you that the only thing we could do for you was the "one room" (so-called) Usonian Automatic which we can show you if you come to see it. 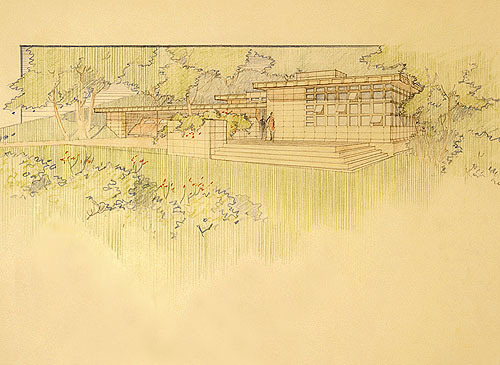 Sincerely, Frank Lloyd Wright, October 4th, 1955. Though they declined to build the home, they continued to follow Wright and his work, even purchasing Japanese prints, which they later donated the the University of Iowa. 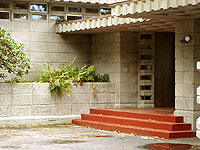 There were seven Usonian Automatic homes built using concrete molded blocks. Adelman (S.344), Pieper (S.349), Tonkens (S.386), Kalil (S.387), Turkel (S.388), Tracy (S.389) and Pappas (S.392). Others were built using this method, but constructed of standard concrete blocks. 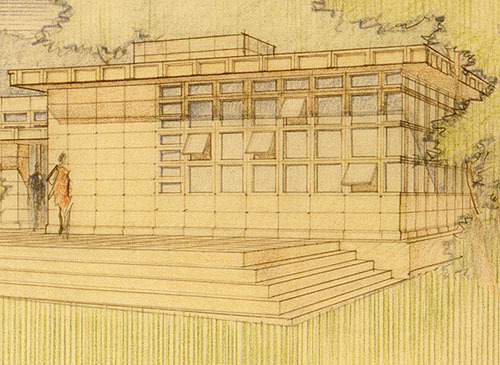 A: Original 1955 drawing of the Usonian Automatic concrete block Blumberg Residence. 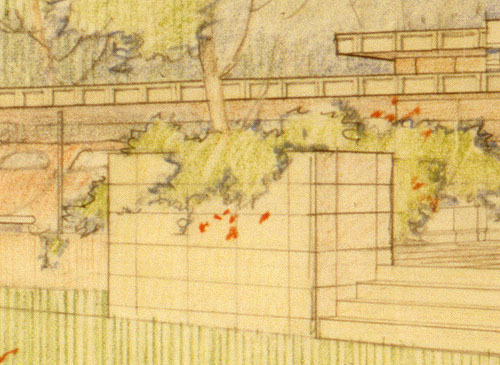 B: Detail of the original 1955 drawing of the Usonian Automatic concrete block Blumberg Residence. Living Room is on the right. 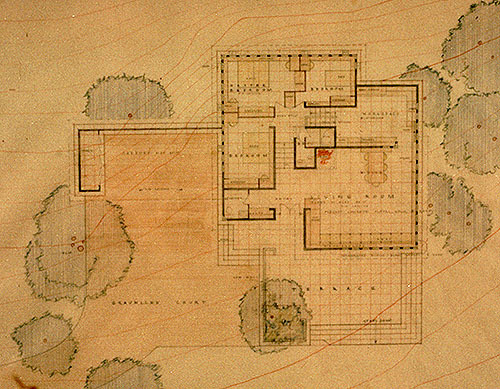 C: Detail of the original 1955 drawing of the Blumberg Residence. Designed with 1' x 2' and 2' x 2' blocks. Living Room is on the right. 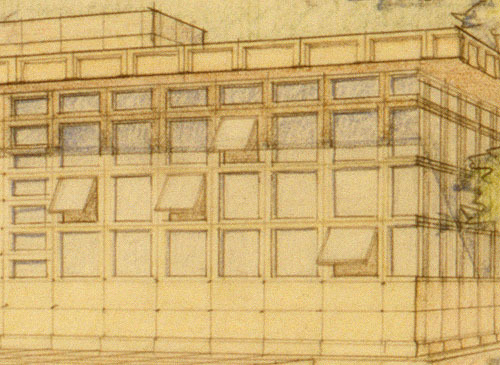 D: Detail of the original 1955 drawing of the Blumberg Residence. Designed with 1' x 2' and 2' x 2' blocks. Glass is embedded in the Living Room blocks. E: Living Room is designed with glass embedded in 1' x 2' and 2' x 2' blocks. Corner blocks have mitered glass corners. F: Planter is designed into the front Terrace. 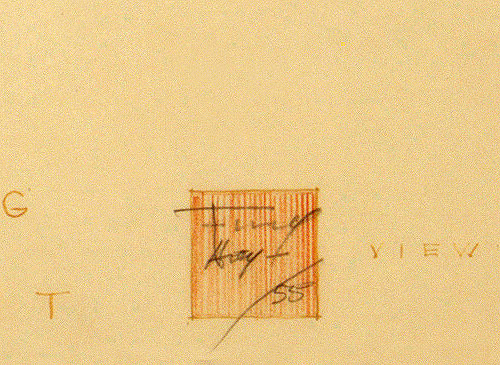 G: Frank Lloyd Wright's signature and date within the red square. Floor plan for the Usonian Automatic concrete block Blumberg Residence. 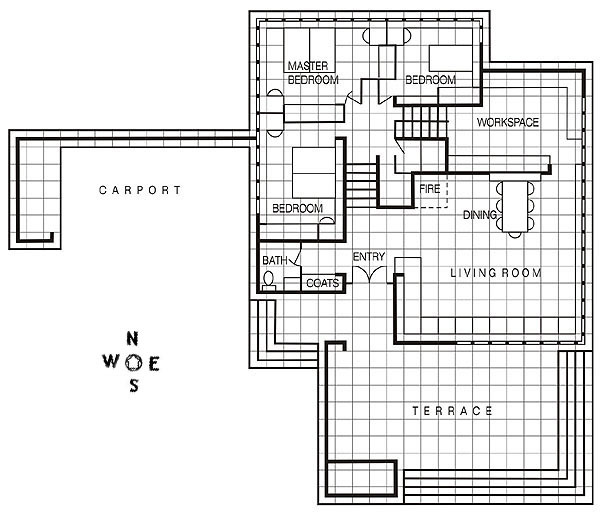 Detail of the Blumberg Residence floor plan. Floor plan copyright Douglas M. Steiner, Copyright 2009. Letter dated May 2nd, 1955. Response to Mel Blumberg, inviting him to Spring Green. Signed by Eugene Masselink. On Taliesin West Letterhead, includes envelope with Phoenix Postmark, Ariz. May 4, 1955. Dear Mr. Blumberg: You are right (although the word "overtaxed" has a more than normally unpleasant ring) we are en route Wisconsin and Mr. Wright will be there after May 15th. You are welcome to come to see him if a mutually convenient time can be arranged. You could telephone us there at Spring Green 9248. Sincerely, Eugene Masselink (Signed), Secretary to Frank Lloyd Wright. May 2nd, 1955. Letter dated September 20th, 1955. Response to Mel Blumberg, "...happy to hear your enthusiastic reaction to your sketches. Signed by Eugene Masselink. On Taliesin Letterhead, includes envelope with postmarked Madison, Wis. Sep. 22, 1955. Mr. Mel Blumberg, Clinton, Iowa. 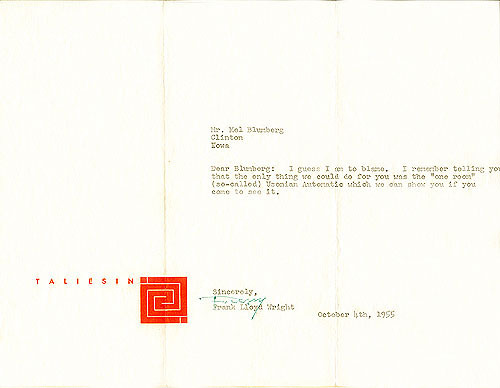 Dear Mr. Blumberg: We were happy to hear your enthusiastic reaction to your sketches - yours and Mrs. Blumberg�s. We shall expect to see you here on the afternoon of October 1st - unless anything unforeseen arises in which case I shall contact you at once. Sincerely, Eugene Masselink (Signed), Secretary to Frank Lloyd Wright. September 20th, 1955. Frank Lloyd Wright Foundation Contract dated September 20th, 1955. 5% of $25,000.00, proposed cost of house... $1,250.00. To Mr. Mel R. Blumberg: On account for Preliminary Sketches according to terms above: 5% of $25,000.00, proposed cost of house... $1,250.00. The Frank Lloyd Wright Foundation, Frank Lloyd Wright Architect, Taliesin: Spring Green: Wisconsin: September 20th, 1955. Letter dated October 4th, 1955. 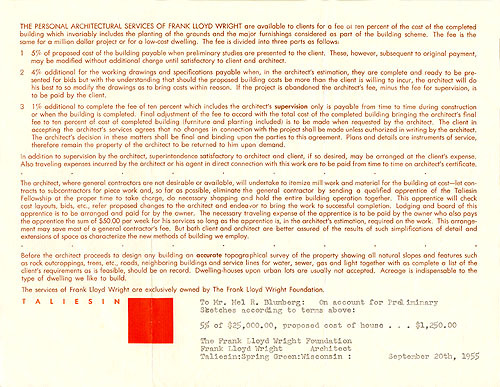 Response to Mel Blumberg, After visiting Wright and grasping the size and cost, the declined to proceed with the home. 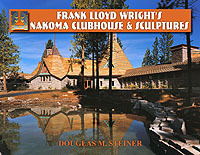 Signed by Frank Lloyd Wright. On Taliesin Letterhead, includes envelope postmarked Madison, Wis. Oct. 5, 1955. Mr. Mel Blumberg, Clinton, Iowa. Dear Mr. Blumberg: I guess I am to blame. I remember telling you that the only thing we could do for you was the "one room" (so-called) Usonian Automatic which we can show you if you come to see it. Sincerely, Frank Lloyd Wright (Signed), October 4th, 1955. 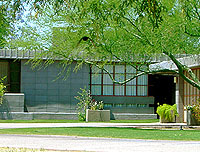 If you ask the average person on the street who Frank Lloyd Wright is they would probably know he was an architect, but may not be able to name one of his works. If you ask the same average person who Grant Wood was they probably would look at you with a blank stare. But show them American Gothic and their eyes would light up with recognition. Grant Wood (1891-1942), was born in Anamosa, Iowa, but lived primarily in Cedar Rapids from 1901 until 1934. From 1913 to 1915, Wood lived in Chicago. After a stint in the Army (1917-1918) Wood returned to Cedar Rapids and began painting seriously and teaching art in the Cedar Rapids Community School District. Wood�s home and studio was located near downtown Cedar Rapids, Iowa, from 1924 to 1934. 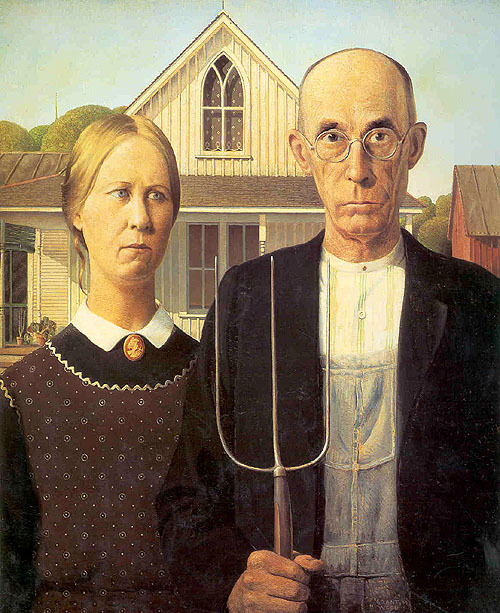 It was in the Studio that Grant Wood painted one of his most famous works of art, American Gothic. Wood left the studio at 5 Turner Alley in 1935 upon receiving a teaching position at the University of Iowa and moved to Iowa City. Grant Wood�s American Gothic caused a stir in 1930 when it was exhibited for the first time at The Art Institute of Chicago and awarded a prize of $300. Newspapers across the country carried the story, and the painting of a farm couple posed before a white house brought the artist instant fame. The Iowa native, then in his late 30s, was enchanted by a cottage he had seen in the small southern Iowa town of Eldon. He asked his dentist and his sister Nan to pose as a farmer and his unmarried daughter. American Gothic remains one of the most famous paintings in the history of American art and has become part of American popular culture. So, what is Grant Wood's connection with Mel Blumberg? One year after painting American Gothic he painted the Plaid Sweater. 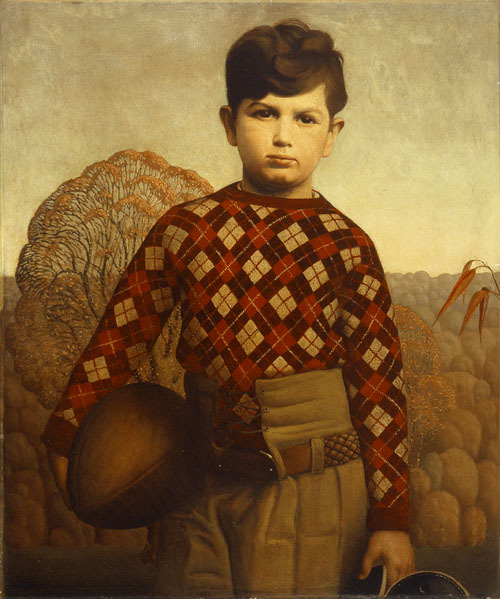 The boy in the "plaid sweater" is Melvin Blumberg of Clinton, Iowa, whose mother, commissioned Wood to paint her son in his favorite clothing, the red and tan argyle sweater and padded football pants with braided belt. Mel was about 11 or 12 at the time. Most mothers would have insisted that their children dress up in their best outfits for formal portraits. Mel however, was allowed to wear his football clothes. In 1984 with the coordination of Edwin B. Green, Mel and Carole Blumberg donated the Plaid Sweater to the University of Iowa, Museum of Art. "American Gothic" Grant Wood 1930, The Art Institute of Chicago Collection. "Plaid Sweater" Grant Wood 1931, The University of Iowa, Museum of Art. Oil Painting on Masonite. 29.5" H x 24.125"
Text copyright Douglas M. Steiner, Copyright 2009. "Wood / Wright, Little Houses on the Prairie" Behrens, 2002. 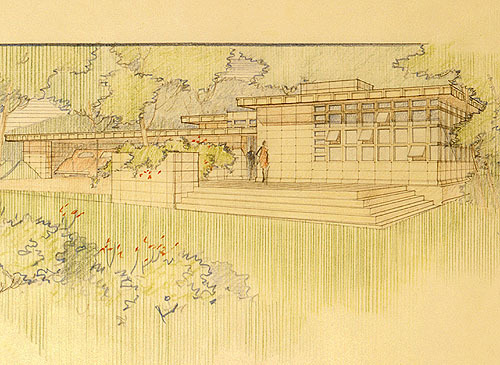 "Frank Lloyd Wright, Complete Works 1943-1959", Pfeiffer; Gossel, 2009, page 388.